Jill pounded the wall that separated her apartment from her new neighbor. Her feet were sore and her back was aching. She’d worked another double shift at the restaurant. She’d been screamed at, had her tush pinched, and one of her tables had completely stiffed her. She needed to unwind. Was it too much to ask for a little peace and quiet? Jill rearranged the plush pillows that surrounded her on her well-worn sofa and turned the volume up on her TV. She still couldn’t hear the news over her neighbor’s music and she was getting angrier by the second. She didn’t care if they were new or not. It was ten o’clock at night, and Jill had enough of the noise. She pounded on the wall again. “Hey! Would you mind keeping it down?” she shouted. Jill waited for a response, but nothing happened. Maybe it was her imagination, but the stereo’s pounding beat seemed to be growing louder by the minute. Jill took a sip of her tea. She tried to force herself to remain calm. Working at the restaurant had taught her both boldness and patience. She counted in her head, but was up and standing by the time she’d reached fourteen. Jill pulled on her clunky boots at the door, and slid into her jacket. It was bitter cold outside and it had begun to snow. Snow dusted the walkway in front of her apartment building like confectioner’s sugar. She stuffed her hands inside her coat pockets as she made her way to her noisy, loud neighbor’s apartment. A man was standing in front of the neighbor’s dark doorstep in just a t-shirt and jeans. Apparently, she wasn’t the only one that was fed up with the racket. The unforgiving wind blew against them both. Jill ignored any trepidation she might have had. Under different circumstances, she never would have invited a stranger inside of her home, but she couldn’t allow this man to suffer from frostbite and exposure. Even stray cats deserved better than to be out in the frigid winter elements. “Thank you so much!” the man said as he followed Jill back to her place. “I didn’t want to bother anyone…” his voice trailed off as Jill opened the door for him. “Oh my God!” Jill said, when she closed the door and took in the sorry state of her neighbor. His skin looked ashy gray in appearance and his teeth were chattering like typewriter keys. “Here!” She grabbed a fleece throw that had been previously draped over a chair, and handed it to the man. He immediately wrapped it around his shoulders. 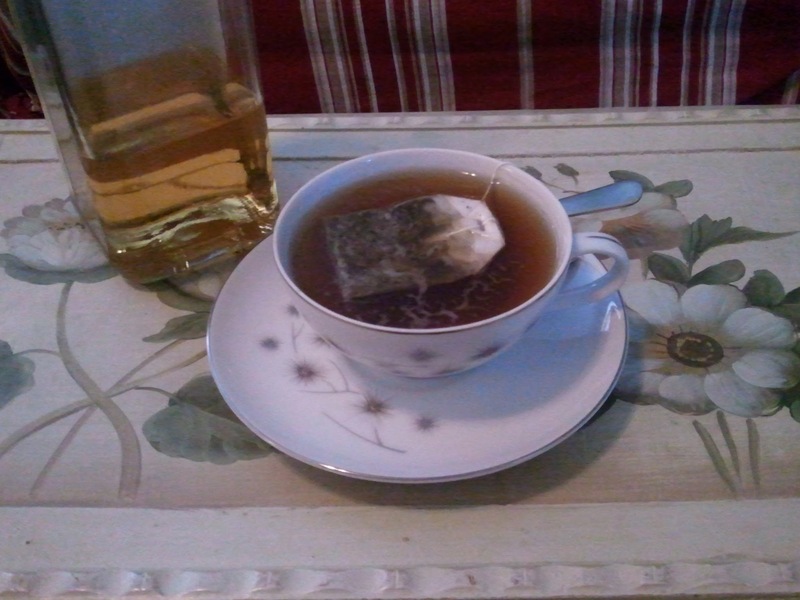 Jill got a teacup from out of the cupboard, and a fresh teabag. “Sugar, honey, lemon?” Jill called out. Jill reached for the squeeze bottle of honey. It was in the same cupboard as the Worcester sauce and the half empty bottle of whiskey, leftover from her last birthday. She pulled the bottle of Tullamore Dew from out of the cupboard as well as the honey, and headed into the living room with her neighbor’s cup of tea. He eyed the bottle of alcohol with a quizzical expression. Jill went back to the kitchen and got the number off of the fridge. She phoned the office, and then joined her neighbor back in her living room. Jill shrugged. “Why not,” she answered. He seemed like a decent guy, and Jill was a good judge of character when it came to people. She sat down beside him on the sofa and turned off her TV with the remote. The walls seemed to reverberate with the noise from the other apartment. Jill nodded and took her cup when it was offered to her. Maybe it was the whiskey talking but they both found each other’s names extremely funny. Jill was almost disappointed when she heard the knock on her apartment door. “It looks like maintenance is here,” Jill said. “Yeah. It looks like I’ll be out of your hair.” Jack didn’t seem to be in any hurry to get up, but did so reluctantly. Jill answered the door and Jack handed her back the throw he’d worn like a shawl. It already smelled a little like his cologne. Jill hugged it to her chest. “Oh, there’s no husband,” Jill said, looking down at her ring finger in embarrassment. “It’s not an anything ring. I only wear it when I’m at work. It keeps most of the creepy guys away. I started wearing it after I broke up with my last boyfriend. It’s stupid.” Jill felt her face grow warm despite the chill air coming through the partially opened front door. “You too,” Jill said, and closed the front door. She felt ridiculous for having the cheep ring on her finger in the first place. It figured. Jill tried not to think about the ring or Jack. She told herself that she wasn’t ready to meet anyone new anyways. Sure it had been six months, but she’d only recently felt like she’d gotten her life back together. She was happy. She didn’t need a man in her life again to feel complete. Jill began to clear away the dishes from the coffee table. Jack must have gotten back into his place. The music had been turned off and all Jill could hear was the clock ticking gently on the wall. Jill thought about turning the TV back on, just for the background noise. Her apartment almost seemed too quiet after the clamor from earlier. Jill was startled when there was another tapping at her door. She frowned before answering it. Jack was on the other side holding two dessert plates. Previous postPost Christmas Ramble/Happy Boxing Day! Thanks! Trust me, you can make just about anything “a little Irish!” LOL Have a wonderful New Year and thank you for stopping by! Thank you so much Trev! It was fun to write. I Love doing the Blogophilia prompts. Have a Happy New Year! this was a fun, sweet write 🙂 loved the Jack and Jill humor, too! I NEVER planned doing any of this. I never planned on being a writer. I thought I’d be doing something different with my life. I thought I’d end up working in a science or medical related field. My FAVORITE course in college was BIO chemistry! True story. I LOVED that class. I had a great teacher and I felt like a mad scientist on lab days with my goggles on and my white lab coat. I looked forward to that class. My teacher was an older gentleman from the Philippians. He had a really thick accent. To this day, I want to say the phrase “molecular molecule,” with his accent. 😉 He! He!